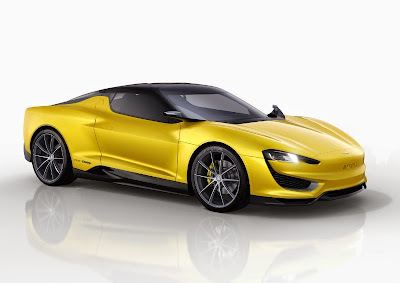 Magna International Inc. is set to debut MILA Plus, an innovative two-seat hybrid sports car at Geneva Motor Show 2015. The concept vehicle, which will be displayed at Magna's booth #6261 in Hall 6, combines a sophisticated, lightweight construction with an intelligent, alternative-drive solution to produce maximum performance as well as eco-friendliness. With an all-electric range of 75km and a vehicle weight of 1,520kg, MILA Plus achieves reduced CO2 emissions of 32g/km. "Magna's broad range of services – from engineering to diverse product capabilities to full-vehicle contract manufacturing – helps support our customers as they continue to be challenged with the changing dynamics of the automotive industry. The MILA Plus vehicle concept illustrates our value proposition and advantage within the global supply base," emphasized Günther Apfalter, President Magna Europe and Magna Steyr. Cold mechanical joining, a hybrid process in combination with bonding is used on the BIW. This reliable technology is more cost effective versus traditional welding solutions and is a joining process Magna has used on other vehicles including the Mercedes-Benz SLS AMG and Aston Martin Rapide. MILA Plus plug-in hybrid system achieves a reduced emission of 32g/km CO2. The performance of the three-cylinder gasoline engine is enhanced by the addition of two electric motors - one between the internal combustion engine and transmission to drive the rear axle, and one on the electric front axle. This arrangement results in an electric all-wheel-drive system which transmits more torque to the road and results in improvement of vehicle maneuverability and dynamics.